Would a bigger Doodlebug be a Doodlebigger? It certainly could be a Doodle Bigger or a Doodle Bigly This thing is long and now I'm wondering why I made it so. a few weeks back I woke up with plans to chop it down 3-4", I had it in my hands, I figured out a way to work around the flat steel piece that is glued in for support and I decided not to do it after all. Oh well. I will have to live with it now and hopefully not have any problems when it is on the RR running laps. The SS Doodle Bugger is getting close to steaming off down the track. Here is an update on the slow going. Real Doodlebugs used to have issues with keeping the motor from overheating so the crew decided to add a large radiator on the roof. 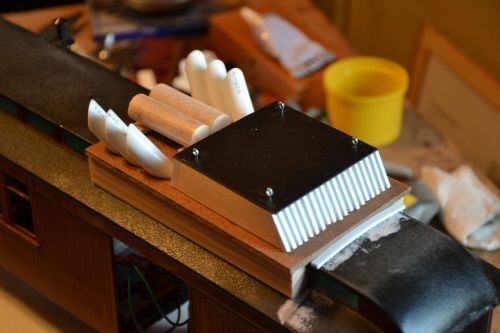 I cut a wedge of wood and glued styrene pieces with E6000. I used craft stick pieces as spacers and once it started to set up I carefully removed each of them. 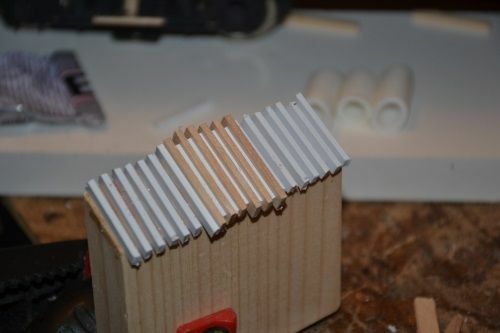 The next day I sanded the styrene pieces flush with the top and bottom and then repeated the process on the back. 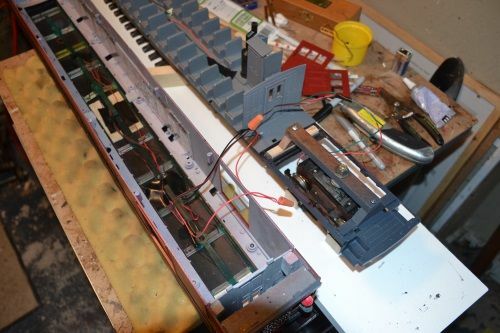 Here is the radiator in place with a sheet of black styrene on top and cotter pins used as lift points. The crew got a bit crazy with the exhaust stacks when they angled them. They thought the Doodlebugger needed a bit of styling flair but I'm not sure about them. They do make the Bugger look like it is going to take flight down the track so maybe we can play this flair off to "art deco" ? The twin tanks are there to take up space and are made from dowels. They could be for coolant expansion? Here is another detail part that will be installed onto the side of the Doodle Bugger. 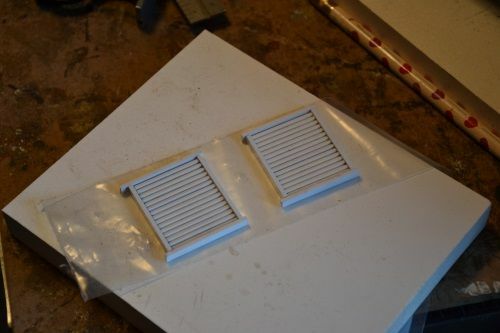 The vents are built using styrene strips for the sides, a thin flat piece on the backside and 15 quarter round slats. They are 1 3/8 wide by 1 3/4 tall. I used this technique to create louvered intake vents for my 250 ton crane and I think they look pretty good. It is getting to be crunch time now and with family coming Friday to stay a couple of days I will be further behind schedule. You sure that thing is not turbocharged? Turbos are for pansy rice grinders. Blowers are for big boys toys. And if one screw is good two screws have got to be better right? 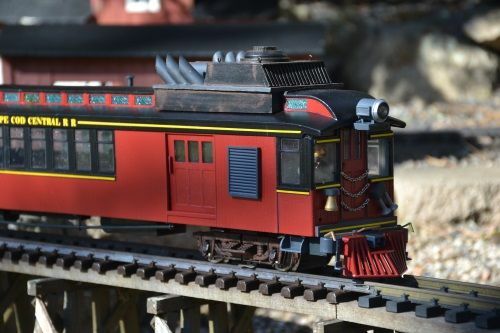 That is one cool boxcab Rooster AND I see it has a Blower ! Today some odds and ends were painted and touchups. Tomorrow I might be able to spray some clear coat. When it all starts going back together I will wire in the rear truck to the motor and the headlights. The council masters state there are "NO rules" on Boxcabs so I see no reason why it cannot apply to Doodlebugs as well? Get busy as you only have a few days left ! Lots of imagination around here, one reason this place is so enjoyable. As soon as a car with turbo charged, nitromethane burning 500ci displacement motor runs 1000 ft at over 330 mph and just over 3.5 seconds I will listen. Is that boxcab prototypical for Amtrash. Rooster that boxcab must be a real racer with all that roof top go fast stuff bolted on and a wing to keep it on the track! 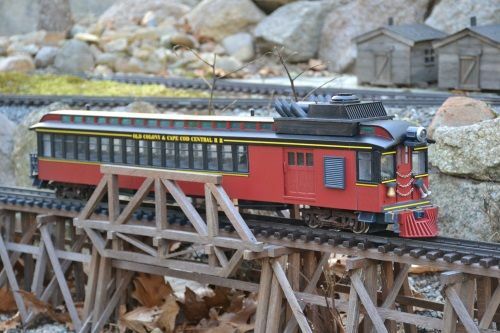 It reminds me of the caboose racer I made for my RR. Here is a video of it in action. The DOODLE BUGGER is DONE as of 5:30 this evening and I was even able to cut out vinyl lettering and install pin striping while glue and paint was still drying. Here are a few photos of the build from a few days ago. My wifes brother and niece only stayed for a day and a night before they headed back to Ireland so they were not too much of a disruption. My Bro in law had no idea what a doodlebug was so I had to school him. 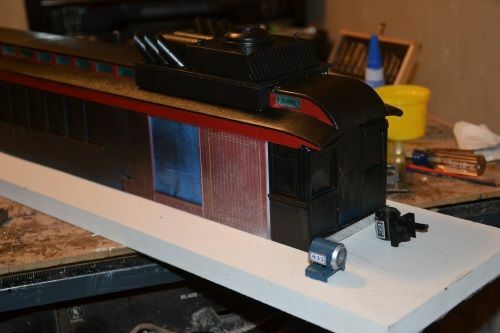 Anyways here was the progress as paint dried and pieces received their final fittings. I thought I was going to need to make headlights but I found 2 in the Big Hauler graveyard box. 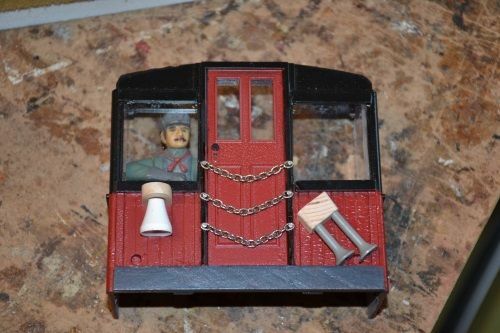 Here is the cab with a Bachmann fireman (sorry dude you had to lose your legs) but you got a new shirt and a mustache. The bell was made from a golf tee and the 2 horns are long shafts from outdoor screws. I used my bolt cuttter to snap off the screw threads and carved up a small block of wood to insert them into. I couldn't find the black chain that I know I have somewhere so the silver will have to do. I carefully drilled small holes in the door frame to accept brad nails, put them through a chain link and glued them in place. The wiring. I used LED's in the headlight and taillight and attached them to the pickups for the motor. The rear trucks also serve as pickups for the motor. 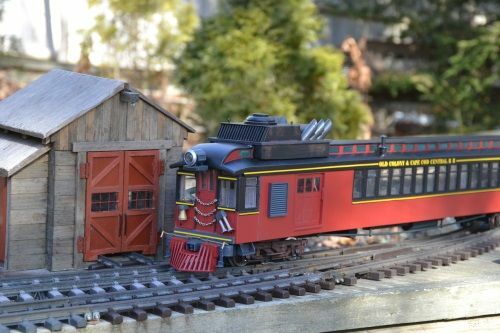 I wired the 4 Bachmann interior lights together and used the existing switch and 9volt battery box. They worked when tested but now only one works so that will need to be explored at a future date. The cow catcher was positioned too high so that had to be lowered nearly 1/4 inch. I ran out of daylight today so hopefully tomorrow I can get a video of this running on the RR for judging. Overall I am pleased how this came out. I bought some styrene strips, a tube of filler that I didn't use much of and a 5 pack of LED's for $15 of which I used 2 so this build cost me approx. $17. Poor guy had no comprehension of how deprived a life he'd been living in not knowing that. The Doodle Bug, Doodle Bugger, Doodle Bigger came together nicely and I am pleased with the results but boy is it long. It looked whacky on the 5' diameter test track and it looks silly on the 8' and 10' curves that I use on my layout but it is what it is. Here are a few snaps and a video of the finished Doodle Bug. Mik 2019 is a success. Well done to everyone that rose to the challenge. Great job!!! love the paint scheme!!! !